I’ve been playing the mountain dulcimer for more than 15 years. I started playing in early 2002 as a relaxation activity. The mountain dulcimer became a personal passion. Today, I’m not just an avid mountain dulcimer player, but I also build and teach dulcimer. 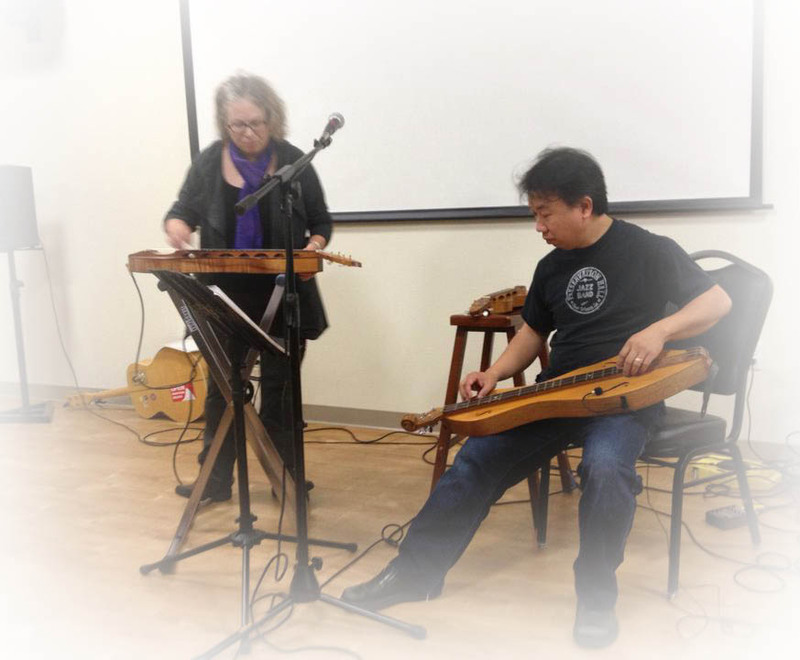 Along with my wife Patricia Delich, we created the documentary film Hearts of the Dulcimer. We’re currently producing a podcast about the mountain dulcimer also called Hearts of the Dulcimer. I offer beginning to intermediate private mountain dulcimer lessons in the Woodstock neighborhood in SE Portland. No previous music experience is required. I can help you learn to play music even if you've never touched a musical instrument in your life. Students learn a variety of ways to play the dulcimer from playing solo instrumental to singing with the dulcimer to ensemble playing with other dulcimers or other instruments. I teach a variety of genres and traditions from American folk tunes to popular tunes like Over the Rainbow and Ripple, to rock and jazz tunes like Looking Out My Back Door and Georgia on My Mind, to old time fiddle tunes to traditional aires from Ireland and the British Isles. Many of the arrangements I teach are written by me since dulcimer arrangements for pop, rock, and jazz tunes are hard to find. Private one on one lessons are $35 for 60 minutes. $25 for 30 minutes. The first lesson includes a free instrument setup to help make your instrument more playable. This may include new strings replacement, action adjustment, and tuner adjustment. Loaner dulcimers are available with a deposit. I also fix dulcimers, If you have an old dulcimer I can back to playing order. I tailor private lessons to fit your needs wherever you are in your musical journey. If you have no previous musical experience, don’t read music, or never have touched a musical instrument, I can help you! •	If you can count from 1 to 5, I can teach you to play music on the dulcimer. •	I will teach you the basics of the dulcimer starting from how to ergonomically hold a dulcimer on your lap. •	I offer loaner dulcimers in case you’re not sure you want to commit. •	I will teach you how to sing with the dulcimer. •	I will teach you simple fun tunes you already know like: You Are My Sunshine, Morning Has Broken, and Scarborough Fair. If you have a favorite song you’d like to play, I’ll consider special requests and write an arrangement for you. If you’re returning to music after a long hiatus, or if you’re playing a string instrument for the first time, let’s have some fun with the dulcimer. •	I will teach you the basics of dulcimer starting from how to ergonomically hold a dulcimer on your lap. •	I will teach you how to play chords and sing with the dulcimer. •	I will teach you how to play lead with the dulcimer. If you already play a string instrument and want to learn to play the dulcimer, it will be very easy for you to learn. •	I will teach you how to play the dulcimer with other instruments. •	Work on left hand exercises that will enable you to play more complex arrangements. •	Expand your dulcimer repertoire by playing non-traditional dulcimer tunes in genres such as jazz, rock, and classical. •	Improvise on the dulcimer so you can play a simple tune in 20 different ways. •	Play dulcimer as an ensemble instrument either with other dulcimers or other instruments. •	Let’s figure out a dulcimer playing style that fits your voice and your songs. •	Let’s work on dulcimer arrangements for your own compositions. •	Let’s try out playing in multiple keys and tunings on the dulcimer to see what works best in creating the emotional impact you’re seeking for your songs. I regularly take my dulcimer to jam sessions. You can do this too. •	You will learn to play chords and sing with the dulcimer in multiple keys. •	You will learn to play the dulcimer as lead or accompaniment with different instruments. My arrangment of the Christmas classic. Played in DGD tuning. My arrangment of the Irving Berlin classic. Played in DAD tuning with 1.5 fret. This is my fingerpicking arrangement of the 1950's classic "Mister Sandman" on Mountain Dulcimer. I'm playing a Simerman dulcimer in FAC, the 1-3-5 tuning. Special thanks to Rob Brereton who introduced this tuning to me. This is one of the tunes I teach in my "Tunes from the 50s fro Dulcimer"
This is my arrangement of Willie Nelson's song "Crazy" on Mountain Dulcimer. I'm playing a Simerman dulcimer with the 0.5 and 1.5 fret. One of my favorite from the Irish harpist and composer, Turlough O'Carolan.